At the Christmas Eve Kucios dinners of my childhood, my father would recount a special story from his, in the early 1930s. Christmas Eve at my childhood home in Brooklyn, New York was a time of joyous fulfillment, when the four weeks of preparation during Advent culminated in the ceremony of Kucios, the traditional Lithuanian Christmas Eve meal. It was the most important family event of the year, when all its members, even those who had married and left home to live in faraway places, felt drawn to join in the ritual. My wife and I try to carry on the Kucios tradition in our own family. When the bright star of Christmas Eve becomes visible in the winter sky, we gather around our table for family prayers. Then we kiss the family crucifix, share our Christmas wafers (plotkeles), and one large apple. As years pass, I repeat those stories that accompany these old customs, just as my father used to do: of Adam and Eve eating the forbidden fruit, an act whose disobedience involved us all and required the birth of the Savior to redeem, and of the sharing the wafer and the apple, which symbolized the family's unity and its spiritual kinship with the rest of mankind through Adam. One year not too long ago, a chair at our Kucios table was empty for the first time. Our daughter, who was then studying at the University of Innsbruck, planned to visit St. Peter's in Rome on Christmas Eve for the midnight mass. She had asked that we keep open a place at the table for her. Since the family Kucios began at 6 PM, it would coincide with the ceremonial opening of the Christmas Eve mass at St. Peter's celebrated by the Pope himself. Looking at my daughter's empty chair, I was reminded of another empty seat, many year's ago, in my parents' home on a Christmas Eve. It was the depth of the Great Depression, jobs were scarce in Brooklyn, and my parents could not even afford to buy a Christmas tree. The empty chair belonged to my grandfather. My family was celebrating Kucios and grandfather was missing. 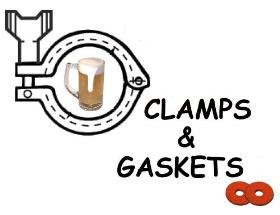 May your empty chair be filled ... and your beer stein, too. Michael Jackson changed my life: not the pop performer, but a rumpled English writer (and, I learned later, an ancestral countryman. His father had emigrated to Yorkshire from Lithuania, as had my grandparents to New York). 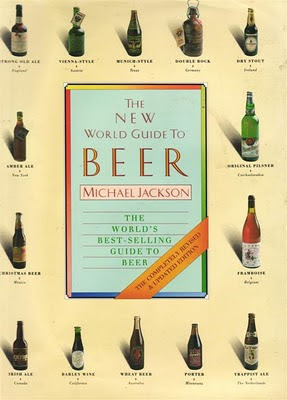 By 1988, I was an enjoyer of better beers, and a homebrewer, but it was Jackson's book of that year, The New World Guide To Beer, that propelled me toward a vocation of beer. I was fortunate enough to have had the opportunity to thank him in person. Jackson died in 2007. 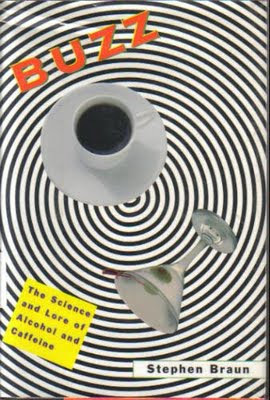 I recently posted a series of reviews of 12 'beer' books. It was not a best of 2009; it was a list of personal recommendations for good gifts and good reads on Christmas Day. Some of the twelve were specifically about beer, others tangentially related. None of Mr. Jackson's oeuvre were on that list. Why? Because they sit above any such list. In the 1970s, when Jackson began to write about beer, literature on its provenance was scant. The world always knew that beer was a noble and complex drink, but, for a moment in history, that was forgotten. Now it is being remembered. in every country that can afford such luxuries, traditional styles of beer are being revived and new ones are being created. His many books since then, erudite, witty, and cyclopedic, should be required reading for anyone serious about beer, or just wishing to learn more. They stand the test of time. So, here's my (non-Jackson) list: 12 'Beer' Books for Christmas. Merry Christmas to all, and fruitful reading in the new year. The original edition of The New World Guide To Beer was published in 1977, but without the adjective "New." There was a reprint in 1997. All editions are currently out-of-print. I know it would not be very much in the Christmas spirit to say this, but: I hate Pete Brown. He is the 2009 British Guild of Beer Writers Beer Writer of the Year. His 2009 book, Hops and Glory, is one of the best books about beer that I have ever read. It's the book that I will never be able to write. Hops and Glory is one man's literal search for the historical India Pale Ale (I.P.A. 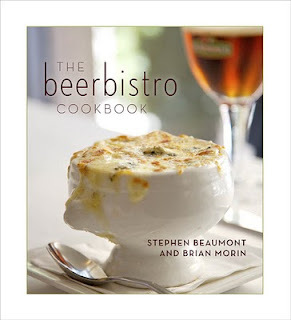 ), but unlike many other 'beer' books, it would be an enjoyable read even for someone who is not a beer geek. And then I realized something else. <...> For all the experimentation that had happened in the [United] States: the recreation of old recipes, the use of new ingredients, the super-high levels of hops, the alcohol levels on a par with wine — the one thing no twentieth or twenty-first century brewer had done was recreate the journey that gave birth to the style in the first place. In Hops and Glory, Mr. Brown channels Bill Bryson, creating a vividly described travelogue. He has an English brewery create a cask of pale ale, and takes it with him from England to India. Along the way, he shares hilarious glimpses of the absurdities of modern life. Like George Plimpton, Mr. Brown records the foibles of a man undertaking a task for which he he is woefully unprepared (in this case, sailing). Like writers of confessions, he can be brutally honest at times, exposing his personal doubts. And, like, dare I say, the late Michael Jackson —the sine qua non of 20th century beer writers— Mr. Brown writes very well. ... for the climax, you'll have to turn to page 411 of your own copy. The bad news is that Mr. Brown has not found a publisher in the USA (although I obtained my copy via Amazon Canada). More bad news: the initial printing is sold out. Good news: a paperback edition arrives in 2010. In the spirit of the season, I retract my initial statement. Thank you, Pete Brown, for this wonderful book. 12 'Beer' Books for Christmas: Today being the Winter Soltice, this is the final post in a a series of 12 recommendations for beer-themed books. American brewing peaked in 1873, when there were 4,131 breweries. By 1978, the industry’s low point, forty-one brewers operated eighty-nine plants. Today breweries number nearly 1,500. Big Brewers scorned honest beer in favor of water swill brewed from cheap corn and rice. The Big Brewers added insult to injury by using crass commercial, linked mostly to professional sporting events, to sell their foul brew to working-class people. Maureen Ogle is a historian who had written previous books on the history of Key West and ... plumbing in America! She began to question this history of beer. As I dug through archives and and old trade journals, I discovered that almost every aspect of that oft-told tale of skulduggery, greed, and woe was false [emphasis mine] and that the truth was considerably more interesting and complex. The result was Ambitious Brew. As Ogle has pointed out (at her entertaining blog), a historian tells a story weaved from facts gleaned from research. The narrative is an essential partner of the scholarship. Late summer, 1844. Milwaukee, Wisconsin Territory. Phillip Best elbowed his way among plank walkways jammed with barrels, boxes, pushcarts, and people. He was headed for the canal, or the "Water power," as the locals called it, a mile-long millrace powered by a tree-trunk-and-gravel dam on the Milwaukee River. Plank docks punctuated its tumbling flow and small manufactories—a few mills, a handful of smithies and wheelwrights, a tannery or two—lined its length. <...> He had been in the United Sates only a few weeks, and Milwaukee's bustle marked a sharp contrast to the drowsy German village where he and his three brothers had worked for their father, Jacob, Sr., a brewer and vintner. It's a wonderfully evocative opening that draws you in, hooked. Along the way, Ogle punctures many myth-balloons, doing what a real historian does: researching the record. You can see Ogle in action, the skeptical historian, during a panel discussion included on a DVD of the beer industry documentary Beer Wars, released earlier this year. Watching her question the statements of the brewers and beer experts on the panel, one is viscerally reminded how male dominated the beer industry —and the 'craft beer' industry— was and is. She gives 'em hell ... gently. 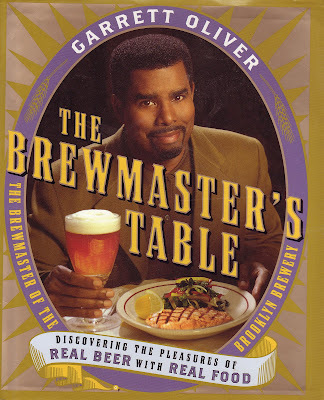 The sartorially resplendent Garrett Oliver is the author of this primer on beer-with-food. The Brewmaster's Table contains no recipes: (only) the enthusiastic prose of an epicurean who has the elegant vocabulary with which to tell us why something tastes good. When we are matching beer and food, the most important thing we're looking for is balance. We want the beer and food to engage in a lively dance, not a football tackle. In order to achieve the balance we seek, we need to think about the sensory impact of both the beer and its prospective food partner. "Impact" refers to the weight and intensity of the food on the palate." 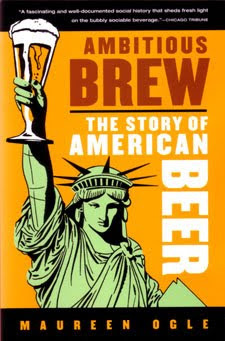 The book is arranged by the beer styles of international regions and traditions; there are a few additional chapters on beer basics and beer-enjoying "principles." Marvelous photographs of beers, brewers, and brewers are interspersed throughout. Oliver is a busy man, by the way. In addition to his duties overseeing brewing operations at the Brooklyn Brewery (which is undergoing an expansion in 2010, doubling the physical size of its plant), he is the Editor-In-Chief for the The Oxford Companion to Beer, to be published by Oxford University Press in 2011. Considering the snow falling on the East Coast today —in my neck of the woods, at 3pm, it's at 14 inches and counting— a barleywine might be just the ticket to beat the cold. That's Dave Alexander in the photo. He owns and operates the Brickskeller —Dining House & Down Home Saloon— which has been pouring good beer in Washington, D.C. since 1959 (which was before Dave's time!). Here, from February 2008, Dave is pouring pitchers of cask-conditioned Below Decks, a 10% alcohol-by-volume (abv) barleywine-style ale from Clipper City Brewing of Baltimore, Maryland. The occasion was his annual Strong Beer Tasting. The pitchers had been filled via handpump from a firkin (10.8 gallon cask) of Below Decks. I want to be right there and I want to know that guy and be there with him ... even if TOM CAN"T COUNT!!! Alan's rules stipulated five photographs as entries. Somehow (! ), I had entered six. Thank you to Alan for the time-consuming task of organizing, prodding, and judging (he called it his "Marital Patience Examination"), and, despite that, still summoning the enthusiasm to secure prizes for us ruck. Jump here for the other winning entries. The photograph which garnered the Grand Prize is of a cask ale in all its magnificent, active, glory. I can remember a time not too long ago when Christmas/winter/holiday beers seemed to be limited to only a few, such as: Anchor Our Special Ale, Sierra Nevada Celebration, Samuel Smith's Winter Welcome, and some local brewery and brewpub offerings. Now, it's a blizzard (sorry) of options. Don Russell is the "Joe Sixpack" beer columnist for the Philadelphia Daily News. His book Christmas Beer is part breezy history (Rudolph the Red-Nosed Reindeer was created by an ad writer for Montgomery Ward department store in 1939), descriptions of Christmas customs around the world (Nicholas of Myna in what is now Turkey —the patron saint of brewers— became Dutch Sinterklaas, who then became our Santa Claus) and even some recipes, such as Wassail, Pffeffernuse, Bier Fisch. First and foremost, however, Christmas Beer is a compendium and review of 'Christmas' beers, with honorable mentions and a Top 50 list. The beers chosen comprise a wide variety of styles and flavors, quite a contrast to the relatively recent past. Such lists may eventually become obsolete, but even so, they gain their own historical value. Russell is not reticent about calling the beers 'Christmas' beers rather than winter or holiday. He has influential friends. Here's part of his interview with Fritz Maytag of Anchor Brewing —the granddaddy of the craft beer movement in America, and maker of one of the first revivalist spiced 'Christmas' beers in the US. [Initially, in 1975, unspiced] "it was designed to be as noncommercial as it could possibly be, so we wouldn't offend anyone," Maytag notes. "I knew perfectly well it was a bit naughty to mix a religious holiday with beer ... but I don't think I've heard a single word of criticism from anyone." The following year, Maytag boldly labeled his holiday beer, "Merry Christmas and Happy New Year: Our Special Ale." Christmas beers are ales and lagers made by breweries around the world once a year, as a gift to all of us kids at heart. Full of flavor, they often contain secret ingredients ; typically, they have a bit more alcohol, for a nice way to settle into a long winter's nap. I won't spoil your fun of discovering which beers Russell anoints in his 'best-of' list, but, as there's a blizzard outside tonight, I will mention Heavy Seas Winter Storm, at position #35.
this ale features no less than five hop varieties, including those northwestern darlings, Cascade, Centennial, and Chinook. You'll find an underlying sweet malt base that tones down the tang a bit, but with all those aromatic hops, that's a little like saying the sun was shining until that massive nor'easter barreled down the coast and shut down I-95. Caveat lector: As an employee of a beer/wine wholesaler in northern Virginia, I sell the beers of Heavy Seas (Clipper City Brewing). Volume One covers barley, malting, and other things. 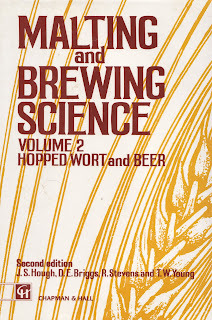 Volume Two (pictured above) covers hops, wort, and beer. The science of beer, by the way? It's called zymurgy. There's a lot more to learn, and these two textbooks don't include much on mechanical issues, and they were originally published in the 1980s. But if your vocational intent is indeed serious, you'll study them until they are dog-eared. For more avocational purposes (and that implies no disrespect), read instead Brewing Lager Beer by Greg Noonan and Designing Great Beers: The Ultimate Guide to Brewing Classic Beer Styles by Ray Daniels. Both are superlative primers, and less of a drag on your wallet. There are many other how-to-brew books, but this is my list of one book at a time, and I've already cheated with four suggestions. Happy brewing to you: it's an all-consuming passion. This is another in a a series of 12 recommendations for beer-themed books —one per day, until the Winter Solstice, 21 December. Christina Perozzi goes by the Twitter name of @BeerChick. Hallie Beaune could as well.Together, they've written 2009's newest beer book: The Naked Pint. Nothing groundbreaking here; history of beer, zymurgy 101, beer styles, beer terminology, beer cookery, homebrewing. They include a nice appendix of resources. Their mantra is simple: "Beer is good." It's the approach they take in the book —introducing neophytes to beer, minus any haughtiness— and that's the strength of the book. No, no, no! We don't want that reaction! We don't want you to like this beer because it doesn't taste like beer! We want you to love this beer because it's representative of the variety of beer flavors that exist, the imagination that brewers have, and the skill with which they apply their knowledge and art. We've said it before and we'll say it again: There is a beer out there for every person, even the haters. There are beers that "don't taste like beer" but do indeed taste like beer. [emphasis mine: right on sisters!]. In addition to "The Neophyte" (for which are suggested many other non-fruit beers), the other 'categories' are "The Sophomore," "The Devout," and "The Promiscuous." For the last group, the authors recommend beers such as 'imperial stouts,' sour beers, bitter beers, and 'extreme' styles. Bubbling up from just below the surface is the authors' reach out to a large group of potential beer drinkers who have been understandably put off by macho descriptions and male marketing of beer, including even (and sometimes, especially) those of the 'craft beer' ambit. As Chris O'Brien put it: putting the ale back in female. The Naked Pint might be best for those just beginning to learn about beer. But you know, I thoroughly enjoyed the book myself. Caveat emptor: I received a complimentary press copy (read: free) at a book signing in Washington, D.C., hosted by the National Beer Wholesalers Association. The event included a demonstration of the versatility of beer with food. Perozzi and Beaune —and a local chef— paired 5 beers with 'small plates, ' ranging from fried risotto balls to flour-less chocolate brownies. "We want to de-mystify beer education," they told us, using terminology all can understand, rather than jargon: butter rather than diacetyl, chocolatey, grassy, etc. The Naked Pint is also available as an ebook for the Kindle: here. Not everyone liked the book. "It's easy to like" but with some technical problems. Here's another opinion. Originally written in 1989, The Great Good Place is about the missing community forums of modern American life, and the essential need for those meeting places to be re-discovered and re-nurtured. 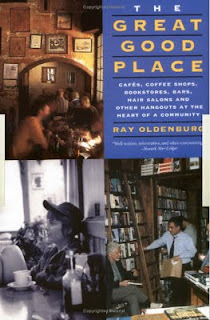 The author, Ray Oldenburg, is Professor Emeritus at the Department of Sociology and Anthropology at the University of West Florida in Pensacola. Oldenburg takes his title from a Henry James short story, in which the Great Good Place is a place of brief supernatural respite. Oldenburg's vision isn't quite so passive or mysterious. His so-called 'third places' are real places, such as brewpubs (and bars). The environment in which we live out our lives is not a cafeteria containing an endless variety of passively arrayed settings and experiences. It is an active, dictatorial force that adds experiences or subtracts them according to the way it has been shaped. When Americans begin to grasp that lesson, the path to the planners' offices will be more heavily trod than that to the psychiatrists' couches. And when that lesson is learned, community may again be possible and celebrated each day in a rich new spawning of third places. Its message applied, The Great Good Place can be a manifesto for true community activism, democracy in conversation. To "think globally, yet drink locally" can be one, enjoyable, portion of thriving locally. 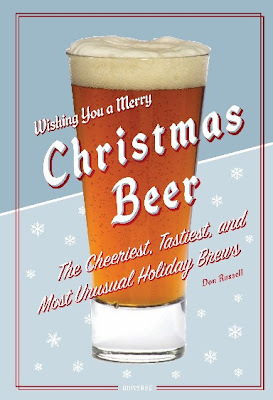 12 'Beer' Books For Christmas: the full list here. After the six or so basic tastes —salty, sweet, sour, bitter, savory, and fat— the sense of smell is essential to flavor. It might be the most important contributor, but science is still not quite sure of how it works. 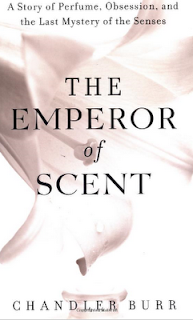 The Emperor of Scent is the fascinating tale of Dr. Luca Turin, a biophysicist at the University College of London, who set out to prove that aroma is detected by the vibrations of molecules. It's a theory that has been soundly rejected by peer review ... with no theory offered to fully replace it. New York Times writer (and perfume critic!) Chandler Burr writes about Turin's work for (and against) the perfume industry, but the general principles of this still infant science of smell apply as well to good fermentables. If you can't smell it, you can't taste it. This is one in a a series of 12 recommendations for beer-themed books —one per day, until the Winter Solstice, 21 December. At its heart, making beer begins with cooking: kilning sprouted grains, then stewing them and boiling their juice. Understanding the science of cooking —the chemical reactions that occur— is essential for success for both professional chef and brewer. If you were a pro, you'd be studying scientific sources. 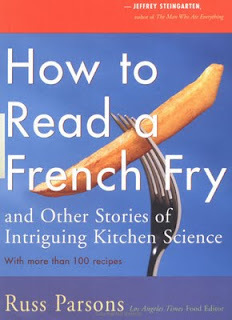 If you're not, reading How to Read A French Fry by Russ Parsons —the food editor and columnist of the Los Angeles Times— would be an enjoyable introduction to some of that science. Everyone loves deep-fried foods, as a glance at any fast-food menu will prove. Yet most people would sooner tune their own car or perform minor surgery on a family member before they would try to fry in their own kitchen. <...> Perhaps no other type of cooking involves quite as many variables or requires as many decisions on the part of the cook. If an aspiring brewer, you might want to turn to page 229 where Parsons writes about the Maillard reaction. The browning of food is one of the more important flavor developments when barley is kilned, and there's a lot of science involved. Parsons, of course, talks about this not in relation to beer, but to solid food. Although browning bears some resemblance to both burning and caramelization, it's neither. It's actually more closely related to what happens when bread bakes than to anything else <...> attributed to something called the Maillard reaction, named after the nineteenth-century French scientist Louis-Camille Maillard. He found out that the brown of roasted meat and the brown of the crust of bread are both due to a chemical reaction that occurs when you heat amino acids and sugars. This is the second in a a series of 12 recommendations for beer-themed books —one per day, until the Winter Solstice, 21 December. Today, I begin a series of 12 recommendations for beer-themed books —one per day, until the Winter Solstice, 21 December. This is not a Top 12 list. It is my list of 12 beer books, personal delights. On Christmas Day: put your feet up, pour yourself a good beer, and read a good book. Better yet: give a friend the gift of a beer and a book. The science is over a decade old, but I would guess that much remains correct in this book. Stephen Braun is a science writer, so he writes 'scientifically' for a lay audience. If you're a user (that is, lover) of beer, wine, or spirits, it might behoove you to understand alcohol's good and bad, how and what. Far from being a simple depressant, alcohol is a subtle, complicated drug that exerts a wide range of pharmacological effects. <...> By releasing endorphins, alcohol resembles opium, giving users a rush of pleasure similar to the "natural high" experienced after a vigorous workout. And the caffeine in your coffee or tea? Beyond [one and four cups of coffee], pouring more caffeine into the brain probably won't increase stimulation —and it may have the reverse effect [a depressant effect] because of caffeine's actions on other molecular subsystems. "You're convincing no one on Turkey Day with your parsnip/veggie loaf talk," was the comment. Well, this was our Thanksgiving menu. We started with Cranberry-Apple Relish. Then, Potato/Parnsip Latkes and Zucchini Pancakes, topped with Citrus-Creamy Spinach. The main course was a Seitan Loaf in Cremini Mushroom Gravy. On the side were Cider-Braised Brussels Sprouts and Dark Ale-Roasted Carrots and Parsnips. There was a Honey-Roasted Ham for the meat-eaters, but by the time all the veggie courses had been served, most of the ham remained. Dessert was a store-bought Blueberry Pie and a home-cooked Tofu-Pumpkin Pie. I was asked. I didn't know. I took out the tape, and measured. Now I do know, and you can too. Here are the exterior dimensions of a stainless steel firkin. 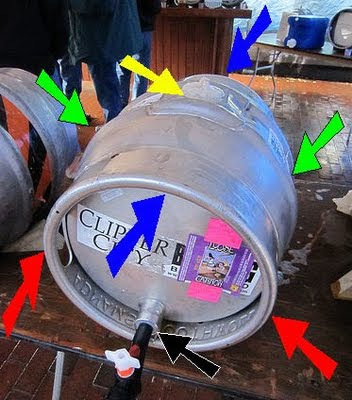 The length of the firkin from back chimb [blue arrows] to the protruding end of the tap [black arrow] is 23 3/4 inches. An inserted cask widge provides a similar measurement. This is a critical measurement when installing a firkin in a small space, such as underneath a bartop. A firkin is a beer cask that approximately contains: 10.8 US gallons = 9 UK gallons = 40.8 liters = 86 US pints. There are no legal standards of construction for beer casks. Dimensions may differ per manufacturer. More on firkin volumes: here. The length of a cask with a tap inserted was something I had somehow neglected to measure. Thanks to Charlie Buettner, brewer at Mad Fox Brewing Company, who took some of the measurements for me. #FollowFriday is @DeirdreReid: tech, social media, and ... beer! Word on the street: Clipper City Brewing to discontinue its Oxford Organic line of beer. Mmm, Marmite: "English condiment that is perhaps the foulest compound legally sold for human consumption." http://bit.ly/8IbliC.